As the first examination of women's foremost contributions to Jerzy Grotowski's cross-cultural investigation of performance, this book complements and broadens existing literature by offering a more diverse and inclusive re-assessment of Grotowski's legacy, thereby probing its significance for contemporary performance practice and research. Although the particularly strenuous physical training emblematic of Grotowski's approach is not gender specific, it has historically been associated with a masculine conception of the performer incarnated by Ryszard Cieslak in The Constant Prince, thus overlooking the work of Rena Mirecka, Maja Komorowska, and Elizabeth Albahaca, to name only the leading women performers identified with the period of theatre productions. This book therefore redresses this imbalance by focusing on key women from different cultures and generations who share a direct connection to Grotowski's legacy while clearly asserting their artistic independence. These women actively participated in all phases of the Polish director’s practical research, and continue to play a vital role in today's transnational community of artists whose work reflects Grotowski's enduring influence. Grounding her inquiry in her embodied research and on-going collaboration with these artists, Magnat explores the interrelation of creativity, embodiment, agency, and spirituality within their performing and teaching. 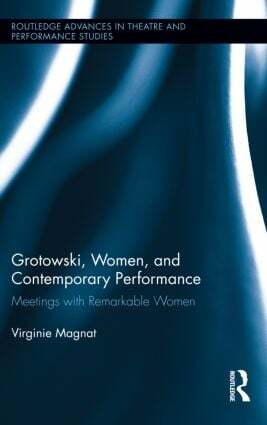 Building on current debates in performance studies, experimental ethnography, Indigenous research, global gender studies, and ecocriticism, the author maps out interconnections between these women's distinct artistic practices across the boundaries that once delineated Grotowski's theatrical and post-theatrical experiments. Virginie Magnat is Associate Professor of Performance in the Faculty of Creative and Critical Studies at the University of British Columbia, Canada.